When Nelida Yanez ran for the Santa Ana City Council in 2006, she enjoyed the support of Santa Ana Council Members Sal Tinajero and Claudia Alvarez. Yanez lost, with 34% of the vote, according to Smart Voter. Now Nelida, and her husband Joe, have turned on their former allies and are supporting the mayoral campaign of Alfredo Amezcua, who is challenging incumbent Mayor Miguel Pulido. The Yanez family is hosting a fundraiser for Amezcua on March 27, from 3-5 pm, at 1125 South Sullivan, in Santa Ana. See the graphic above for RSVP info. To further convolute things, the supporters of the guy who beat Yanez in 2006, David Benavides, are now supporting Amezcua as well. These supporters include Thomas Gordon, who is also running for the Santa Ana City Council this year. Joe confirmed in an email to me yesterday that he is supporting Gordon against Tinajero, even though the latter supported his wife’s campaign in 2006. You can see in the graphic above that Nelida Yanez was endorsed by Alvarez and Tinajero. Amezcua has a long history of working with Pulido. There are many residents who question whether he might end up being another Pulido. When Pulido beat Michele Martinez in 2008, Amezcua showed up to his election night party in a limo, according to Gustavo Arellano of the O.C. Weekly. Mr. El Puma hair do. Nope, you can’t borrow my new YUDU! I respectfully disagree with a 2 of your points. 1. Sal was not a Councilmember when he endorsed my wife Nelida. As far as support. We had more adults walking and knocking than Sal and provided him with more than we received. 2. In Our email conversation I stated that I did not consider Thomas Gordon a racist and wolud not stop talking to him on that basis. Period. Supporting the candidate of our choice is part of the American way. My wife and I have never vowed eternal loyalty to any candidate or office holder. I have always and will always vote for the candidate that I believe will serve the people to the best of their ability. If you chose to support others then so be it. You will find that I do not consider other peoples choices as a personal affront. And yet Sal won and Nelida did not. As for Gordon, whether or not he is a racist is unclear but what we do know is that he hangs around with Santa Ana’s “Usual Suspects” – and they most certainly are racist. Support whomever you want to. My point is that Amezua’s past history shows that he is not much different from Pulido. And Gordon is a poor choice for the City Council. Tinajero will beat him easily. 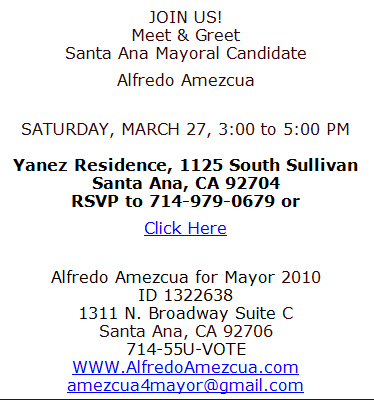 If what is said about Amezcua is true, then it is no surprise that the ‘Yanez family’ is supporting him. ‘Birds of a feather flock together.’ Both husband and wife conduct their lives guided by greed, deception and deep self-interest. Everyone is entitled to support whom they want to support or to hold any political or policy view; however, it is unfortunate and a sad state of affairs that to advance their views they engage in allegation, negative rumor, and character assassination as you did in your post. My RESPONSE: This is an empty allegation. What is SAID about Amezcua? What is the evidence? What has been proven? How credible are they are? What is the intent of the rumor/negative allegation…is it meant to unfairly discredit Amezcua? Again, What is the evidence for this negative characterization? Perhaps I am biased because I know Joe and Nelida personally. Nelida is our immediate past Commander of our veterans organization. In this role she gave selflessly, and tirelessly of her time trying to bring recognition, awareness and appreciation for our veterans, and went above and beyond of what would be expected of a leader because many of our members are older combat veterans that do not necessarily have computers to communicate effectively. Furthermore, she also served in the US Army. I can think of no other way that demonstrates selfless devotion in the service of nation, our community and others. Not just because of the low pay compared to private pay, but because of the time spent away from family and friends. Finally, it seems that every time that Nelida is volunteering in improving our community, we always seem to get TWO for the FREE price of ONE. Joe is right there with Nelida helping to improve our neighborhoods! From my limited perspective, it seems that she is supportive of Alfredo Amezcua because Alfredo seems to have a deep and comprehensive understanding that our City of Santa Ana has faced, is facing, and will continue to face; and because Alfredo seems to offer LEADERSHIP in Education, Safe and Clean neighborhoods, attracting and retaining businesses, and repairing our streets. Again, I would hope that rather than engaging in negative character assassination to advance “your candidate” or view that you focus on the merits of your candidate or your views, because our city deserves better! Francisco Barragan: Hitler is known to have engaged in benevolent acts also. You may know the Yanez’s public facade, but what lies beneath is the source of potential public harm for personal enrichment. Greed, deception and self interest have been Nelida’s and Joe’s game since becoming invovled with politics, boards, commitees, etc. in Santa Ana. When Nelida was involved with the Head Start Program she used this program to enroll her children. These slots should have been allocated to a low-income student, not to a family with two working parents. Both Nelida and Joe have been gainfully employed all their adult lives, yet two of their children have received scholarships for low-income students. These scholarships are for students who meet the Pell guidelines. Joe has always unreported his income from real estate transactions and has been investigated by the IRS. Mr. Barrigan before making any public comment about the Yanez family and to avoid further embarassment on your part please check into their character and their lack of ethics.